Host your important events at the Skywalk Observatory. Social galas, weddings, cocktail receptions and corporate parties for up to 1000 guests. Trust our dedicated event staff with every detail. 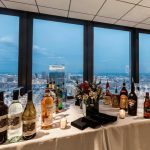 The Skywalk Observatory and Top of the Hub are extraordinary venues for special events — from social galas to weddings, cocktail receptions and corporate parties. 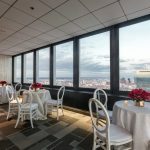 The landmark Top of the Hub Restaurant is ideal for gatherings from 15 to 60 guests, while the striking Skywalk Observatory hosts up to 1,000. For more information, please call Kay McCarthy at (617) 859-3156. 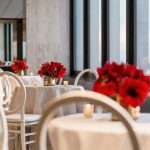 Bringing together incomparable views, delicious cuisine, and superb service, we delight in creating unique, memorable celebrations. Our knowledgeable and professional staff will be with you every step of the way, making planning your event a pleasant and stress-free experience. 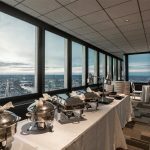 When you’re looking to entertain out of town guests or give staff the VIP treatment, Top of the Hub is the place to be. Our highly attentive staff delights in making every guest feel special. Join us for a cocktail reception or special evening of dinner and dancing. 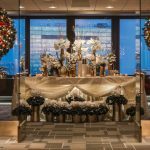 Enjoy the simple, elegant décor of our Skywalk Observatory with its breathtaking views of the city, or transform it into any look you like.